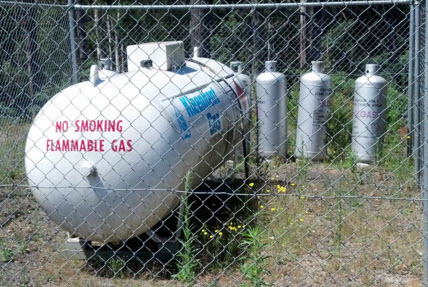 or you would rather not have flammable LPG stored in a bushfire zone. So, how expensive is LPG? Some people assume that ‘gas’ is cheap, but are surprised to see the specific energy cost (cost per unit of delivered heat. 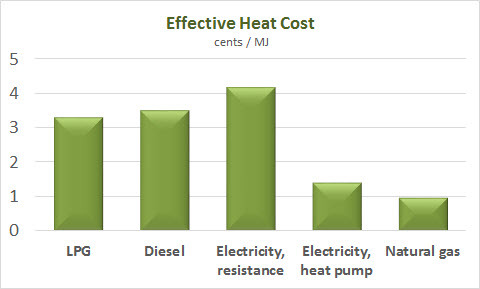 Here is a calculation of the effective cost of delivered heat using LPG and the other most common conventional heat sources (electric resistance, heat pumps, and natural gas). We’ve also included diesel, not because we expect diesel to be used for heating, but to show that LPG is almost as expensive as diesel. These purchase prices are based on contracts which we are aware of, and public comparison site Motor-Mouth. Of course, the price you pay is likely to vary, and this will affect the delivered energy price. So, LPG is an expensive heat source. There are government grants, loans and other financial incentives which make these opportunities even more attractive. Call us to discuss your LPG situation, goals and ideas.